This berrylicious issue of #LEARNABOUT features another berry that ripens throughout summer. Mulberries grow around most US cities, and just like serviceberries that we talked about in Vol. 3, you might find them growing near your house, sidewalks, greenways, and public parks. We will soon talk about how to find them, but spoiler alert: they aren't hard to find at all! Often mistaken as blackberries, mulberries somewhat resemble blackberries. Pictured below are mulberries on the top and blackberries on the bottom. Very similar, huh? So, how do you tell them apart? 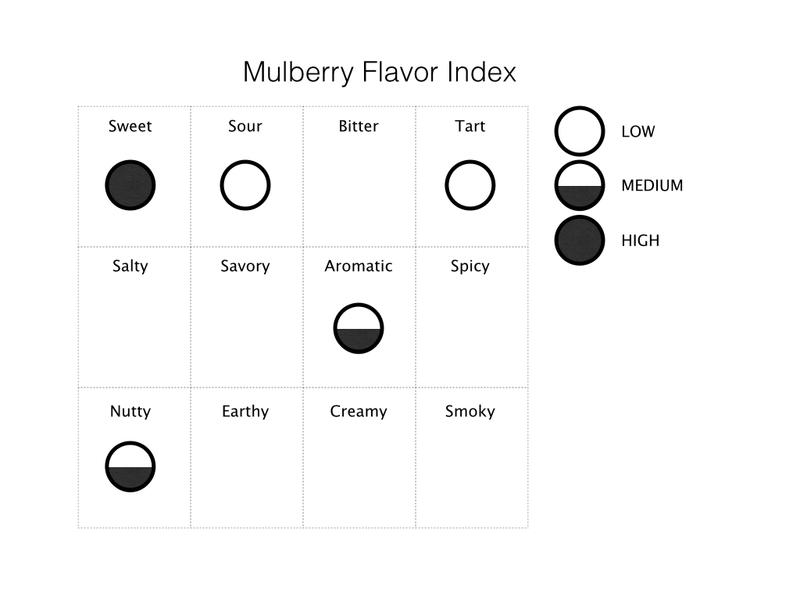 Well, you can taste them :p, but there're other ways too: mulberries are usually smaller than blackberries and usually grow on trees, while blackberries grow on bushes. 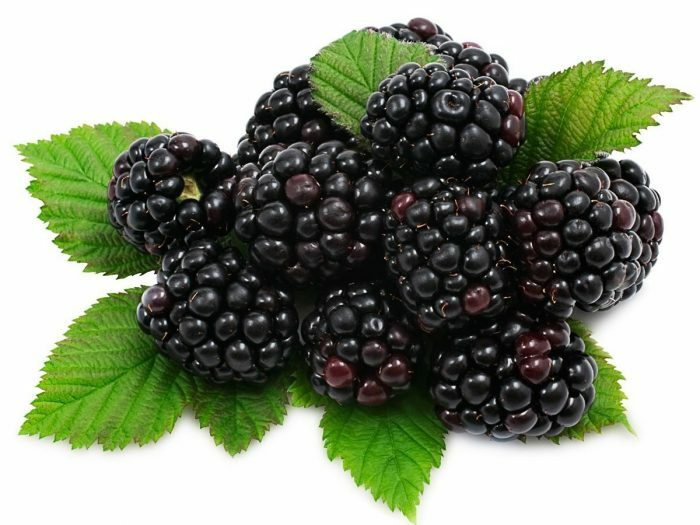 However, the biggest difference between blackberries and mulberries is that blackberries have at the end of its fruits remains of sepals (or calyx) that are attached to the fruits. Mulberries don't have this. On a side note, neither mulberries nor blackberries are typical fruits. Blackberries are what botanists call an aggregate fruit, which develops from the merger of several ovaries that were separate in a single flower. Other examples include strawberries and raspberries. Mulberries are what botanists call a multiple fruit (or compound fruit), which develops not from one single flower but from a cluster of flowers. Other examples include pineapple, jackfruit, and guava. What is a jackfruit? Stay tuned, we might have an issue on it later! Mulberries belong in the Moraceae family, which also includes figs and the world's largest trees: banyan trees. A common feature for this family is a presence of laticifers and milky sap. Try breaking a stem or leaf on a mulberry or a fig tree and you will see white latex-like milky sap running out. So far, we also encountered another family of plant that produces milky sap, do you remember what it was? If not, you can go back and review Vol. 2. Mulberry plants have been around for a while -- the cultivation of this plant traces back almost 5000 years. Surprisingly, people started cultivating this plant not because of its fruits, but because of its leaves. Yes, you're looking at silkworms. Mulberry leaves are the only leaves silkworms eat. They specifically prefer the white mulberry leaves, which produce fruits that surprisingly resemble the worms themselves. Silkworms and mulberry trees are like pandas and bamboo, or koalas and eucalyptus leaves -- they have been living collectively for thousands of years, producing silk and mulberry fruits this entire time for us to enjoy. Nutritionally, mulberries resemble the nutritional content of blackberries/raspberries. 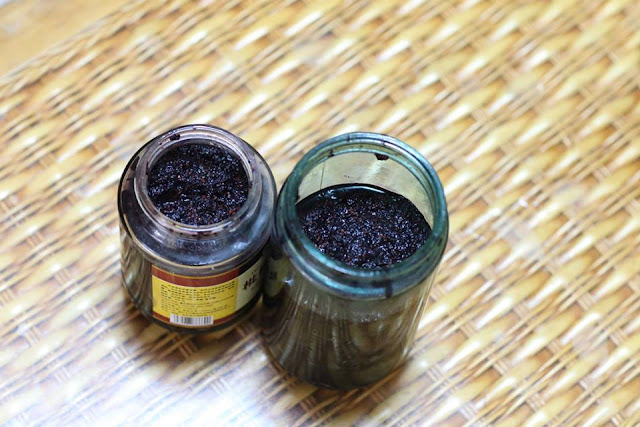 In addition, the purple mulberry juice is used in traditional Chinese medicine to alleviate throat pain. 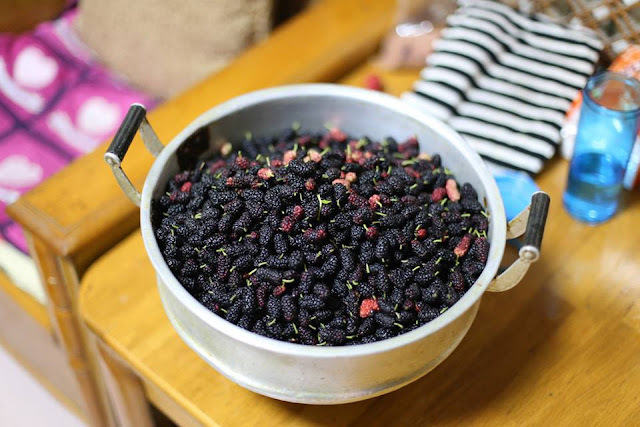 Many argue that mulberries can fight against UTIs, arthritis, eye diseases, weakness of the body, and throat cancer. However, these health claims aren't yet backed by scientific research. Just like serviceberries, it is unlikely that you will find them in supermarkets. 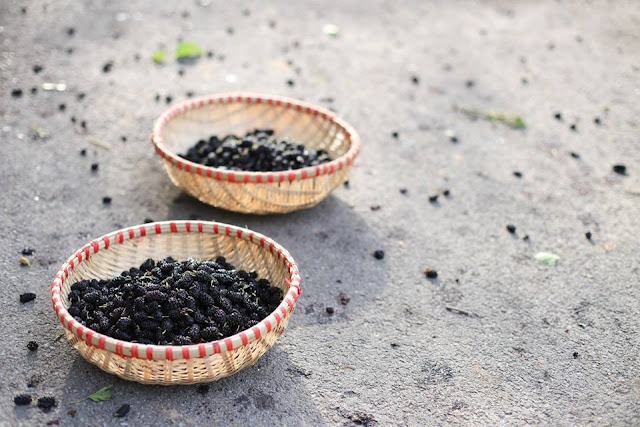 This is due to the extremely short shelf life of freshly picked mulberries -- on average, they'll only stay fresh for up to 3 days in the fridge. You might have some luck at your local farmer's markets, but you'd be better off finding a mulberry tree and picking the berries yourself. Mulberries ripen in waves throughout late spring - summer. This means that not all berries ripen at the same time. Therefore, if you manage to locate one mulberry plant, you will have fruits to pick through the months of June - August. How do you identify a mulberry tree? As I said at the very beginning, it's not a hard task at all. When the mulberry tree is not fruiting, you can spot them by their unique leaves that could take on one of the three forms: entire, mitten, and tri-lobed with sawtooth on the edges. 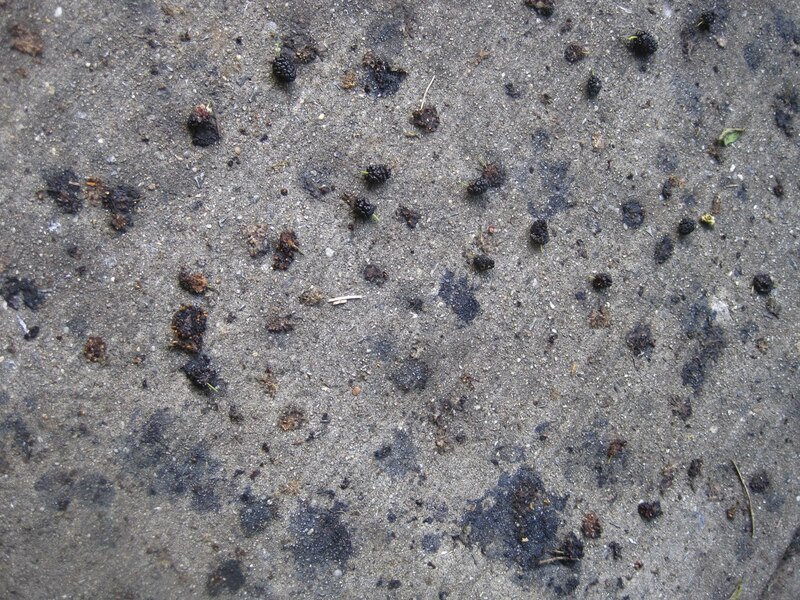 I call them "mulberry puddles," and they're usually the easiest way for you to spot a mulberry tree. After mulberries ripen, they will fall off the tree at the slightest touch, no matter what color it is. Therefore, a slight breeze or drizzle will send these fruits flying, and they will end up in the ground and get smashed and become mulberry puddles. Hence when you pick mulberries, use very gentle pulls -- if you have to play tug of war with the branch, the fruits are not ready. Now go pick lots and lots of them and enjoy a nice afternoon snack! Bake them into a pie. Make jam out of them. You might find dried mulberries from stores, but they come at at exorbitant prices, usually imported from Europe. Here's a picture of the mulberry jam I made last summer. Hint hint: you need a ton of them, and lots of sugar. Do not eat the unripened fruit and leaves (especially the white sap), because they are hallucinogenic and will cause a violent upset stomach and nervousness. Thanks Werner, I fixed the linking issue.